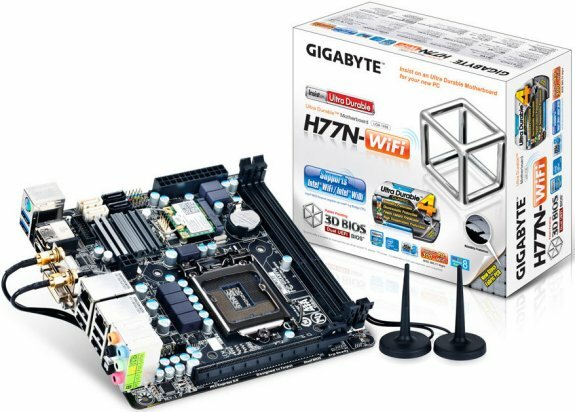 Gigabyte presents the GA-Z77N-WiFi and GA-H77N-WiFi, a new pair of LGA1155 Mini-ITX motherboards with 802.11b/g/n WiFi. Interestingly, both motherboards are likely the only Mini-ITX motherboards with three network interfaces: two Gigabit Ethernet and WiFi. Additionally, the WLAN adapter supports Intel Wireless Display (WiDi) technology, and the motherboard also has HDMI, DisplayPort and DVI outputs. The two are virtually identical, with the exception of the Z77-based model supporting CPU overclocking. This is made possible due to the fact that Z77 and H77 PCH chips are pin-compatible, and it's only a matter of pairing either of those with compatible micro-code.